Thursday April 22nd at Arena, which is at 135 W 41st. Simone Legno, creator of the tokidoki brand and artwork, WILL be there to meet & greet! More info here at the website. LEMI EXCLUSIVE: Our shipment of 10-inch Lemi the Space Wanderer plushes has just arrived from Thunderpanda in Indonesia! Tenacious Toys is the exclusive North American distributor of these beautiful limited edition handmade plushes. They only made 100! Each comes packed in a matching Lemi canvas bag, with a Lemi button and a magnet. At only $19, that's a steal! All preorders will ship immediately. TUTTZ EXCLUSIVE: Not long ago we were lucky enough to attend Toystreet, where we hooked up with Argonaut Resins to hash out an exclusive on a shiny silver colorway of their new Tuttz feline sculpt. They'll retail for around $40, which is very affordable for full-sized, limited edition resin piece! More info will be available soon. ThreeA: The ThreeA forums say that they'll be shipping the retailer versions of the WWRP Bertie Mk2 6.5-inch figures soon, which is excellent. Once we get our Berties, we will turn them around and get them in the mail to all of you who preordered. As for the Dropcloths, we still have preorders available for 3 different versions: Panda Shocktrooper, Deimos Liberator & Commando Uncles. JUN PLANNING: We are very excited to see the first Steampunk Pullip figure from Jun Planning, which will be the Eos figure! We have ordered a case. They will cost about $150 each but they are extremely complex and insanely cool. They are projected to ship to us in July. JAMUNGO: Jamungo has announced that they will be selling some of their AWESOME Squadts to retailers. We are going to get a case of NKD Squadts with the 2 different accessory packs (called QPMNT packs). The NKD Squadts will retail for $75, and the QPMNT packs will sell for $28 for the both of em. Not sure on arrival date but I'll post that up as soon as I know. TOY2R: Where do I begin? There is so much to tell. Toy2R has a HUGE year planned this year. There are a number of mini figure Qee series on the way. There's the 5in Jumping Brains by Emilio Garcia (woo hoo!). I am also supposed to let all my artist contacts know that despite ALREADY having over 50 artists involved (like DrilOne, Leecifer, Pocket Wookie, Sneaky Raccoon, and WuzOne), Toy2R is aiming to make their 15th Anniversary World Tour even bigger by inviting all toy customizers to submit custom Qees to their office by May 1st (yeah I know, not much time, but the offer is out there!). Email Kevin at info@toy2rusa.com for more info. Your Qee will get photographed and cataloged and will join the world tour! Talk about exposure... They'd also need artist names, websites, titles, and any other relevant info. There are no limits to quantity or scale of finished pieces. Got a custom Qee already done? Mail that bad boy in to them! MIMOCO: We have just received our stock of the Infectious x Mimoco Design Contest winning Mimobot USB drives, called GiddyUp. The artwork on them is beautiful: it's a girl riding a giraffe! We have them in stock in 4GB and 8GB versions. BIC BUDDY CUSTOM SHOW: Last weekend I attended a great custom toy show in Brooklyn at a place called Zakka. The platform was the 8-inch BID Buddy designed by Marka27 and made by BIC Plastics. It was a lot of fun and I would have liked to have posted up images of that show already but I have been dealing with taxes ever since. So I humbly refer you to my friend OsirisOrion's blog, where he has posted a great video he took that night at the show. If you have read this far, you are truly my best friend or my dad. Thank you for being my friend. Or my dad. I need your input. I have a lot of Kidrobot open-box figures. Great figures, mint condition. Can't sell them on the site anymore due to new KR rules. I want to do some sort of contest or promotion to give some away, like 10 or 20 figures. Got any ideas? Email me: tenacioustoys@gmail.com . If I pick your idea, I'll send you 6 Kidrobot mini figures for free. I have this email newsletter, facebook, a blog and twitter at my disposal, so I can use any or all of them during this promo. ... and they're pretty creepy! The second assortment from the #1 selling video game includes the Ladysmith Splicer (below) with removable mask, tommygun, and rolling pin accessories and a special 2 pack featuring the Little Sister and Young Eleanor Lamb (above). 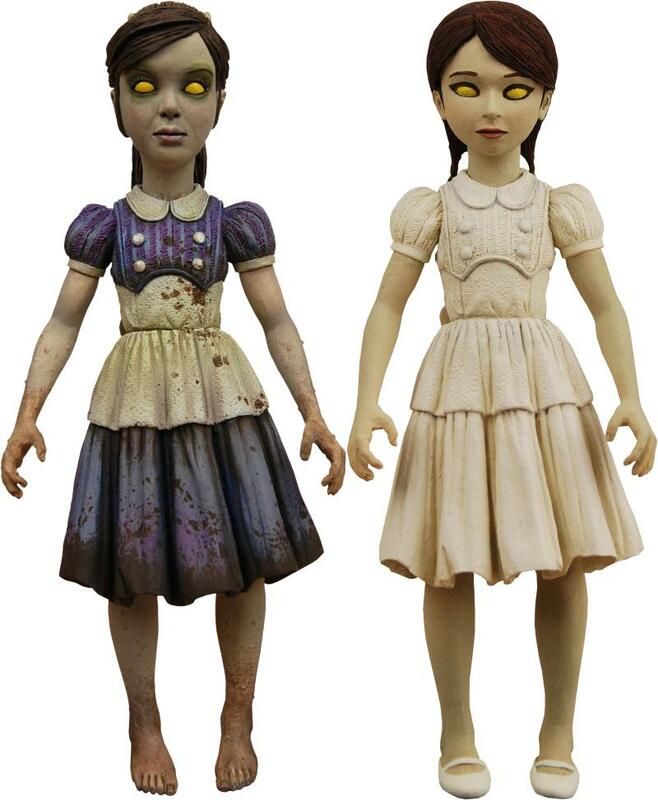 The Ladysmith figure and the Little Sister/Eleanor 2-pack will each retail for around $15 to $17. The Little Sister and Eleanor Lamb figures stand 3 3/4" and are fully articulated. Accessories include ADAM syringes and 2 small Big Daddy Dolls for the girls to hold. How creepy is this Ladysmith figure? Yecch! 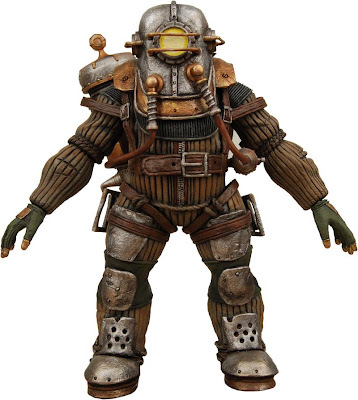 The Deluxe Big Daddy Rosie (above) is packed with detail. Loaded with articulation and tanks that plug into the back. This enormous figure also comes with the Rivet Gun accessory that she can hold in her right hand. This is the biggest and baddest Big Daddy yet! Will retail for around $20. As always, email us if you are into these figures so we get enough to satisfy everyone!